This is strips of paper. Ooooh! That's rather gorgeous Dix! You could hang that on your tree come Christmas. Do you have a pattern for it? Not a pattern as such. I just happen to know know how to do it because I invented that design. :-) And yes, they are meant to go on Christmas trees. Or anywhere else come December. I think I have some rough unfinished instructions somewhere. Can you explain what's going on in words, plz? Is there a dry-seam that invisibly just nicely sits together? Oh, is that an advanced version of a Fröbel star? Cos that's what it looks like to me. Heh. Haven't heard that word for quite a few years, as in Fröbelschool. The verb fröbelen is still in use, and means being busy creating things but perhaps not in a very focussed way, a bit like puttering. It is. Except for the obvious difference (count the number of "corners"). 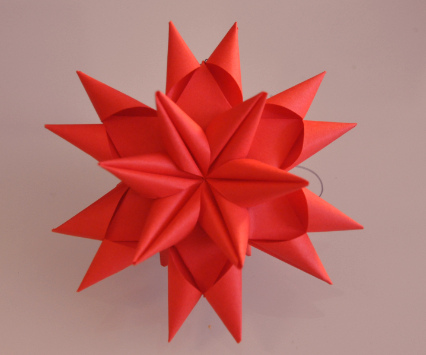 Do you know why it is known as Fröbel star? I don't, but I'd like to! Too early for spoilers. But it's definitely one piece of paper, it all hangs together. The Froebel star carries the name of the German educationist Friedrich Fröbel (1782–1852), founder of the Kindergarten concept. He encouraged the use of paper folding in pre–primary education with the aim of conveying simple mathematical concepts to children. It is, however, likely that Froebel did not invent this item and that it had already been within the realm of general knowledge for a long time. Froebel did encourage paper folding as an activity for young children and he popularised discourse about children's activities, which is how his name and the folding instructions might have become related. Been more than a week, now - you could explain in whited-out text? Whited You fold a paper in half. Cut one half once, midways, to the fold, and the other half twice to the fold, so both cuts end on either side of the one opposite. Fold the paper over. It's kind of an optical illusion. And don't worry - that one has stumped some quite bright people!